YouTube showcased its upcoming Original series and announced renewals for 2018/2019. From ambitious projects and compelling documentaries showcasing YouTube stars, to inventive comedies, bold dramas and live events featuring from some of the biggest names in Hollywood, YouTube continues to offer innovative programming that engages its audience. Since the launch of YouTube Originals in 2015, Original content has been viewed more than 650 million times. There is even a comedy series1 Every rapper has a crew he can't live without... and vice versa. In this new comedy starring Adam Pally (Happy Endings, The Mindy Project), Sam Richardson (Veep, Detroiters) and guest starring Jay Pharoah (Saturday Night Live, Ride Along), we see how long the crew can survive without being in the limelight. This Untitled Pally/Richardson comedy will debut exclusively on YouTube Red in 2019. Other items of note include Weird City, a half-hour comedic sci-fi anthology co-created by Academy Award and Emmy Award winning writer Jordan Peele and Emmy Award nominated writer Charlie Sanders (Key and Peele). The six-episode series is an anthology set in the not-too-distant future metropolis of Weird. Each episode is an exploration of issues that pertains to present day life, stories that could only be told now through the prism of sci-fi and comedy. Special guest stars include: Sarah Gilbert, Ed O'Neill, Dylan O'Brien, Rosario Dawson, Michael Cera, LaVerne Cox, and LeVar Burton, among others. The wildly-popular and critically-acclaimed hit series Cobra Kai from Sony Pictures Television and Overbrook Entertainment returns for season two. And Foursome: five months after they return from Beach Island, the seniors have already graduated and its the last summer that the Foursome is going to be together. Foursome stars Jenn McAllister (All Night), Rickey Thompson (Betch), Cameron Moulene (Faking It), Monica Sherer (Betch), Rahart Adams (Pacific Rim: Uprising), John Milhiser (Saturday Night Live), and Maddy Whitby (Betch). Freeform announces its programming schedule for August 2018, which includes the season two premiere of the Freeform comedy Alone Together and the summer finales of the critically acclaimed series Marvel's Cloak & Dagger and The Bold Type. 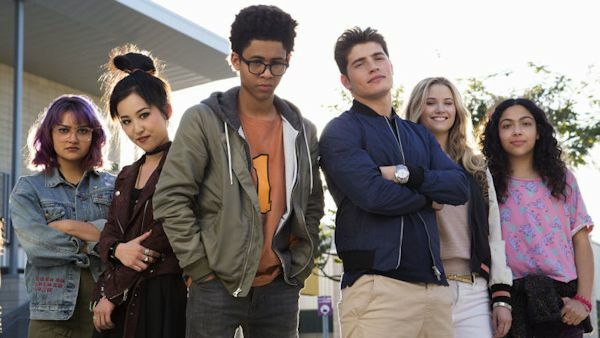 In addition, Hit Hulu Original series Marvel's Runaways will also air an encore presentation of its first season premiere on Thursday, August 2, following the season finale of Marvel's Cloak & Dagger. Additional programming arriving to Freeform this month includes the Freeform premieres of Disney's Cinderella (2015), Daddy Day Care, and The Bourne Ultimatum.